Kathy Shore Nursery in Sparta North Carolina is a Wholesale Christmas Tree nursery with many years of experience growing the traditional Fraser Fir Christmas Tree as well as the less common White Pine Christmas Tree and Concolor Christmas Trees. Fresh Christmas trees add to the beauty of your space by bringing a little piece of the Christmas spirit into your home or business. Taking proper care of your North Carolina Christmas tree will help preserve your investment and keep your tree safe and beautiful for many weeks! Do you have questions about How to Care for Live Christmas Tree? Here are a few tips for keeping your family's North Carolina Christmas Tree from Kathy Shore Nursery fresh and beautiful! If you don't plan to display your Christmas tree right away, store it in an unheated area like a garage or basement keeping it away from wind and freezing temperatures. When it's time to put your tree up, make a fresh 1/2-inch cut at the base of the truck and place it in a stand that holds around one gallon of water. Be sure to keep the water level at or slightly above the base of the tree. Check the water level daily; if the base of the tree dries and becomes covered with sap, it will no longer absorb water. Check Christmas lights for worn electrical cords and try to use lights with low-heat bulbs. The miniature variety produces less heat and lessens the drying effect on the tree. Take the tree down before it dries out. If you maintain your Christmas tree and check the water regularly, your Fraser Fir or any other Christmas tree should last at least five weeks! Recycle your tree!! Many communities offer Christmas tree pick up services. The trees are often recycled into mulch! Follow these steps and your Live Christmas Tree Care will be simple! Kathy Shore Nursery is a Wholesale Christmas Tree Farm in North Carolina offering several tree varieties that, when cared for properly, will last the span of the season! Kathy Shore Nursery features One of a Kind Christmas Wreaths, Luxury Christmas Garlands, Fresh Table Top Christmas Trees, and much more! 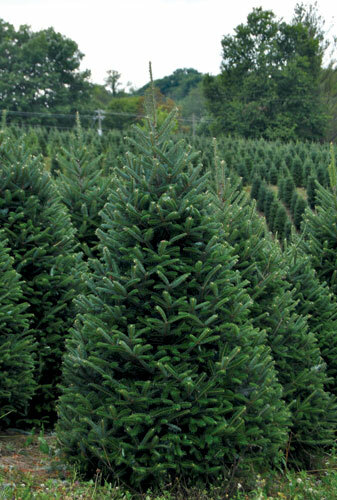 Call Kathy Shore Nursery for more information on products and services like Carolina Fraser Fir Fundraisers and various shipping options!